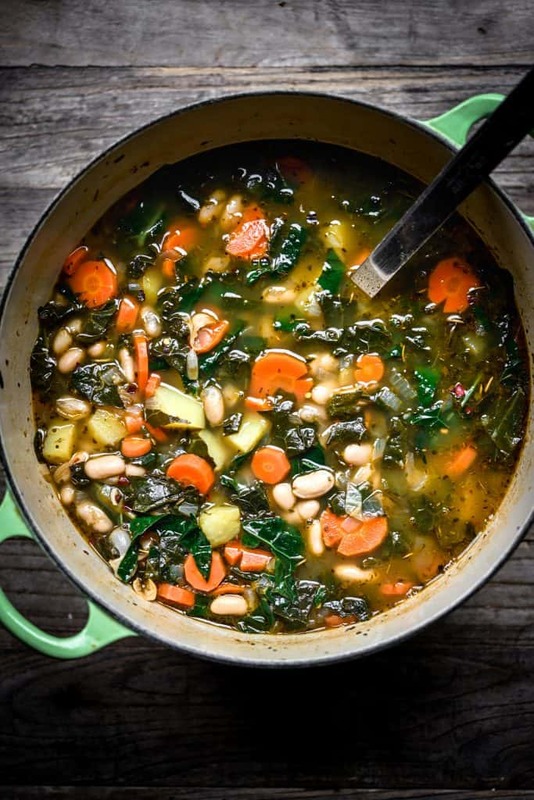 This comforting, one-pot White Bean & Kale Soup is one of our favorite new recipes. It has plenty of fresh lemon for brightness, a kick from red pepper flakes and potatoes for a little heartiness. It’s even better as leftovers the next day! 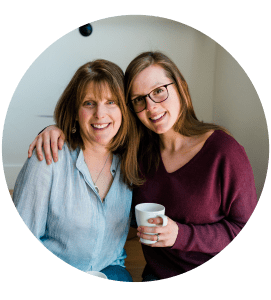 We’re always extra excited about a vegan recipe when my husband Brent raves about it. He’s by far the pickiest eater in our family (yet has excellent taste), so anything Brent-approved is a definite win! Brent is also not vegetarian, although he did recently vow to stop eating red meat other than for special occasions. I actually had nothing to do with this decision. I respect his dietary choices no matter what, but I can’t say I’m mad about it! He happily ate two bowls of this White Bean & Kale Soup for dinner last week and didn’t miss the meat whatsoever. 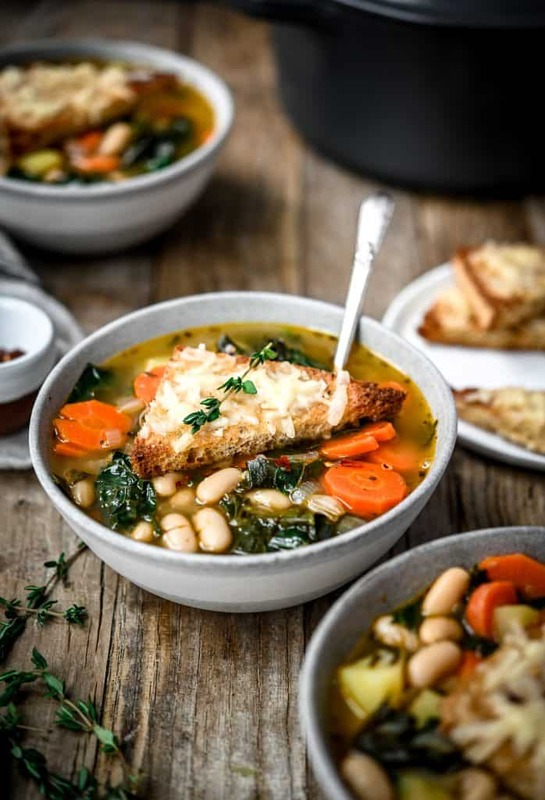 We served this beans and greens soup with cheesy vegan crostini. To make them, brush bread with olive oil, salt and pepper and pop in the oven to toast. Then, top toast with vegan cheese and broil for a few minutes to melt. Not embarrassed to admit that I went through 4-6 crostinis as I ate a bowl of soup. Ok, two bowls. I think fresh lemon juice is the key to this soup. And I don’t mean the stuff that comes in a neon yellow, lemon-shaped bottle. Freshly squeezed lemon juice makes all the difference and heightens all of the white bean and kale flavors. I always squeeze some over the top of this soup right before eating. 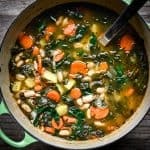 If you don’t have any white beans (aka cannellini beans, aka white kidney beans), you can sub great Northern beans or regular kidney beans. We think the creamy texture and larger size of cannellini beans are perfect for a hearty soup. 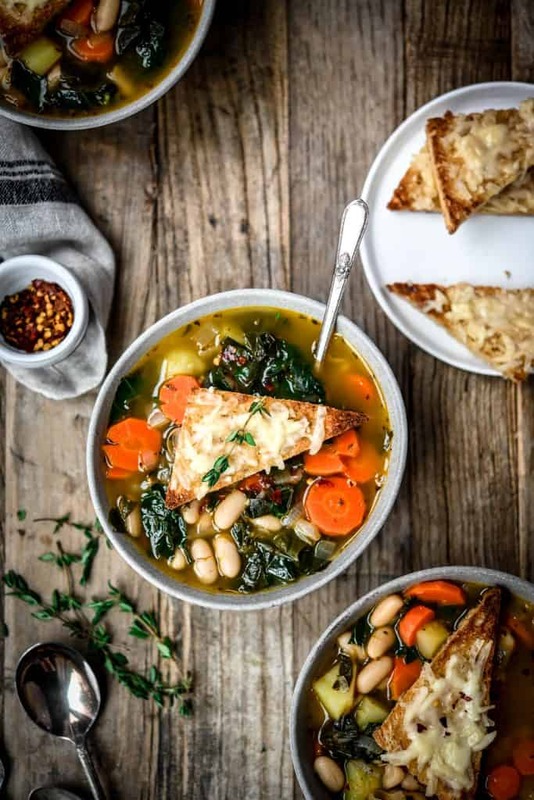 If you don’t like or don’t have kale, you can sub chard, collard greens, or spinach (although note that spinach does not hold up well in soup). 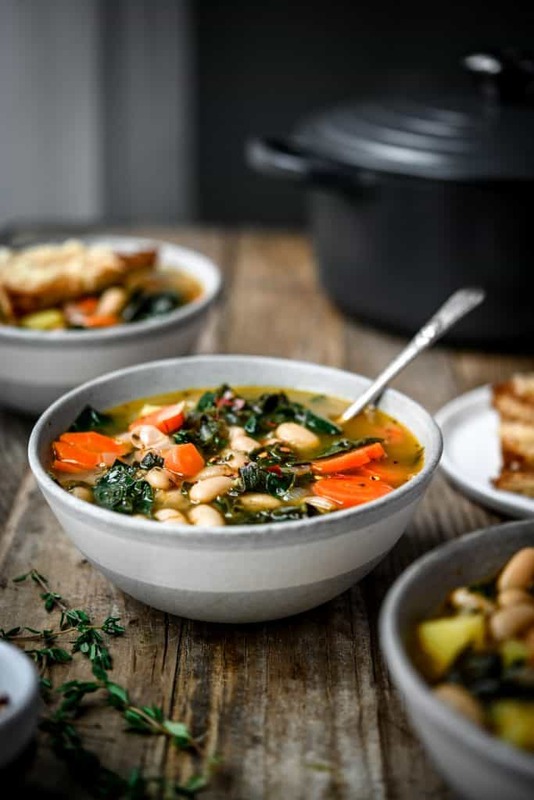 This comforting White Bean & Kale Soup is one of our favorite new recipes – it has plenty of fresh lemon juice for brightness, a kick from red pepper flakes and potatoes for a little extra heartiness. It’s even better as leftovers the next day! Heat oil in large stock pot. Add onion and cook for 5-6 minutes, until softened. Add garlic, carrot and potatoes – stir and continue cooking 5 minutes, until carrots are slightly softened. Add all spices/seasonings, stir well, then add broth and bring to a boil. Reduce heat to low and simmer for 35-40 minutes. Add in kale, cannellini beans and lemon juice and cook until kale is wilted. Taste and adjust salt + lemon as needed. Slice toast into triangles, brush with olive oil, salt and pepper and transfer to baking sheet. Toast in oven for about 10 minutes, flipping halfway through cook time. Remove from oven, rub each slice with garlic, top with cheese and return to oven for 2-3 minutes, until cheese is melty.